'The Americans are approaching; we follow their progress impatiently on the radio, by intercepting messages reserved for the commandos. They cannot be beaten now. But it is up to us to do the impossible to speed up the progression of the bulk of their troops, to facilitate the advance of their spearhead, and, above all, to prevent the Germans from withdrawing to the Rhine in good order, with all their equipment. How many human lives will we manage to save? How many sons of Utah, or of Georgia, will be able to push open the door of their homes thanks to our action, in the near future? Yes, I must fight for "Louis" and all these unknown brothers. 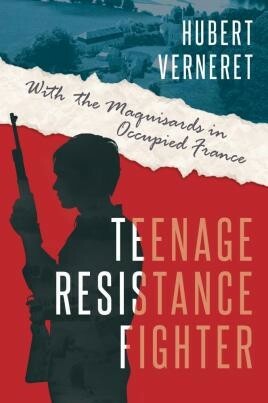 Hubert Verneret was a fourteen-year-old schoolboy in South Morvan, Burgundy, when the Germans invaded Poland, and fifteen when France fell. A boy scout, he helped refugees, aided the gendarmerie, moved wounded soldiers, and dug out bodies after air raids. Throughout, he wrote an eloquent diary that noted not only his actions but his thoughts and feelings as the French troops retreated and the Germans arrived. In 1944, aged nineteen, he decided to join the local maquis resistance fighters, operating from a hidden base in the forest. Though constantly in danger as he undertook his duties, his youthful optimism turned to frustration as he felt he was fated never to fight the Germans, never to take a prisoner. As the Allies approached, the maquisards worked to upset and weaken the retreating Germans to aid the Allied advance.. Hubert details the joy with which the maquisards were welcomed in local villages when the fighting ended. Only as he listened to the speech given as the maquisards disband did he understand that his part in the war, while perhaps not heroic as that played by others, was still important in gaining the victory. Years later, Hubert interviewed local maquisards to understand more about maquis history; their words and excerpts from the diary of a local civilian during the German retreat provide context to Hubert's youthful testimony. This first English edition of Hubert's diary retains the original prefaces by Colonel Buckmaster, chief of the French section of the SOE, and Colonel d'Escrienne, aide de camp to General de Gaulle. For a look at life in occupied France this is an excellent little book, easy to read and easy to understand why things were done the way they were.